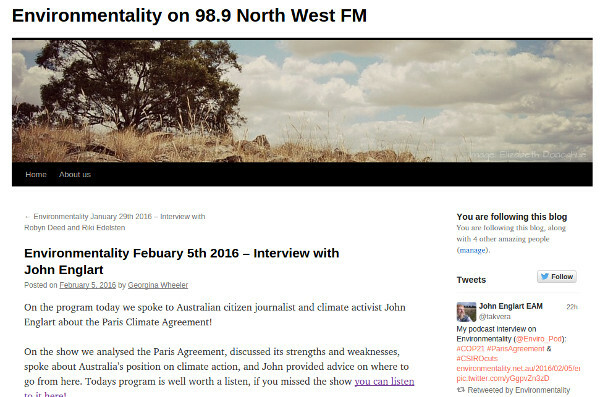 Friday morning I was up bright and early to do a studio interview with Jaime and Georgina on Environmentality, the environment radio program on my local community FM station, North West FM 98.9. I was an accredited NGO delegate to COP21 in Paris and provided reports during the conference via citizen journalist site nofibs.com.au and this blog. I was the guest for Friday morning's program. You can read the blog at Environmentality about the interview and also listen to the podcast. I was sent a series of questions by Georgina, but with Jaime running late, the program launched and did not really follow the script. So enjoy the audio broadcast which parallels but is also different to the script. I had prepared notes to Georgina's questions anyway. This article is based on those notes. John: I have been active as a citizen journalist for 18 years, and over the last 12 years in reading, researching and reporting on climate science and policy. I attended the 4 degrees and beyond climate science conference in 2011 in Melbourne. John: In 2012 I got involved with Climate Action Moreland and Sustainable Fawkner, but I have also had involvement with Friends of the Earth going back to 1976. I participated in the Rides against Uranium to Canberra in 1976 and 1977. Proposing a transition to renewable energy was part of our campaign even then and we set up an alternative energy festival on the lawns of parliament house. In fact I have a photo of me helping set up a demonstration solar hot water system there. But most politicians weren't paying attention then. A few, like Tom Uren and Jim Cairns did. It would be a different world now if more politicians had been on the ball then. Conservative Prime Minister Malcolm Fraser took a wrong turn back in 1977 in backing coal as an energy source. The public, even then, were highly interested in development of renewable energy systems, but the Fraser Government chose to invest money into coal energy research. This was despite Australia's potential in solar energy and our global leadership in solar energy research at the time. John: I incorporated attending the conference as part of a longer holiday to Europe for 3 months with my teenage daughter, partly to ameliorate the flight carbon emissions. So we stayed with a friend in Devon for a couple of weeks, did a couple of 3 day adventures to see Wales and Cornwall. Then had an 18 day bus trip to see the sights of Europe. After this coach trip finished we had a few weeks in Brittany and the regional city of Nantes so we could experience regional France. Why did I choose Nantes? Because it was just a 2h15min journey on the TGV high speed train and it won European Green city of the year in 2013. Nantes also has a dark past once being the major French port for the slave trade. It has embraced that past by building an amazing memorial to the abolition of slavery. I was in Nantes, actually attending a local climate forum, when the Paris attacks happened. That changed the mood immediately. I attended a vigil in Nantes for the victims. Then a few days later we were in Paris. We had an apartment for 4 weeks at Monmartre, and during the two weeks of the conference I got to know the Paris metro very well: my commute was on 3 train lines then a shuttle bus: but it really took less than an hour as the metro trains were very efficient and ran every 5 minutes. I was blown away by the amount of information to absorb and choices to be made at the conference: negotiation sessions, press conferences, official side-events, country pavillion side events, climate e-spaces forums, exhibitors. I was part of a Australian civil society group which met every morning and exchanged information. As I was there from Climate Action Moreland affiliated through CANA with the global Climate Action Network, I was able to participate and slot in to the CAN International network processes and meetings. These included strategy meetings before and midway through the conference and a daily one hour meeting at 2pm at the conference. It was good being part of this broader network which provided intelligence and updates. CAN also run the Fossil of the Day awards during the conference which can be quite influential on the negotiations and country stances and it can make the negotiations more publicly accessible. I was a small part of the process of Australia being awarded a Fossil of the Day award in the daily CAN meeting and voted for the award. I think I attended nine of the ten Fossil of the Day award presentations. See my 2015 Fossil of the Day Awards video Playlist. With so much information and events happening concurrently it took me a while to find my niche and focus. The conference was exhausting, an amazing incredible experience. I was also able to meet up with a few organisations and people I have communicated with online and meet them in person. That was a valuable opportunity. John: The Paris Agreement contains a two part goal. The first part is to limit warming to well below 2 degrees and pursue efforts to achieve 1.5 degrees. The second part is to peak emissions as soon as possible and to balance emissions and carbon sinks in the second half of this century - so decarbonisation by midcentury and then carbon neutrality. It sets out an international framework with Finance, Loss and Damage, technology transfer, transparency and compliance, 5 yearly reviews. Much of the framework mechanisms and rule details still needs to be developed by the secretariat and the two permanent subsidiary organisations. National climate plans are still voluntary and of course what has been promised so far results in an emissions gap to the stated goals. This gap is 2.7 to 3.5C. The agreement established a 5 yearly review cycle where it is expected that targets and commitments will be increased over time. It was originally envisioned under the Durban plan that the agreement would come into force in 2020, but the agreement is actually more ambitiuos in this regard. The agreement comes into force after 55 countries with at least 55% of emissions ratify it. This could potentially be during 2016. A high level leaders signing ceremony has been set for the United Nations in New York on 22nd April 2016. The agreement also starts a process of country long term decarbonisation plans to 2050. This is a highly important component of the COP decision. Georgina: The science - is it enough to hold the increase in global temperatures to well below 2 degree C? John: It provides temperature and emissions goals to aim for and an international framework. It was agreed by all 195 nations. So it provides leverage that grassroots groups can use on governments at all levels and business. We can say: "here is what you agreed to. The science says we must do this to get there. You need to implement the policies in accordance with the science and the goals." Georgina: Your perception of COP21 and the perception of other key people in this area such as Naomi Klein. John: Naomi Klein is right that everything needs to change and finding solutions to climate change should make us question fundamental questions about economy and society and the power of corporations. Going into Paris activists new the agreement wasn't going to be nearly enough. There is still a large emissions gap. And they were right. That was the purpose of the redlines protest on December 12 in the streets of Paris. To keep the momentum with people and in the streets. We need to keep building the climate movement to force the changes necessary. We can't rely on our politicians and diplomats. There is substantial grassroots momentum out of Paris, in stark contrast to the bleak mood when Copenhagen failed in 2009. It was a surreal and powerful feeling attending the redlines protest near the Arc de Triumphe and then marching through the streets of Paris to Trocadero and down to the Eiffel Tower. The Australian Climate Guardian Angels lead this march and a sitdown occupation of the Pont d'Iéna across the Seine near the Eiffel Tower. While I was going to the conference at Le Bourget each day, the climate angels manifested at various locations around Paris. They appeared outside the conference venue on the first day, and were part of a protest at Le Louvre about the role of fossil fuel sponsorship of the arts. 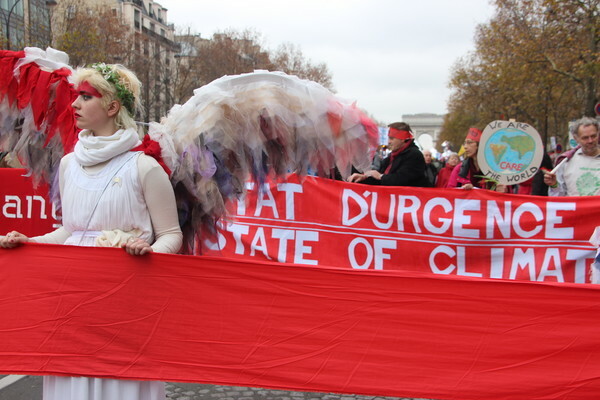 The climate angels blockaded the offices of Engie, formerly known as GDF Suez. This company was one of the major corporate sponsors of COP21. Engie are also the majority owner of the dirty polluting Hazelwood coal fired power station and mine which caught fire in January 2014. The fire burned for 45 days impacting the health of residents. Two years later and the company have just recently been charged with 10 counts of breaching the Victorian Occupational Health and Safety legislation. Our paths crossed only on three occasions: at the human chain for peace event at Place de la Republic and on Boulevarde Voltaire; at the Pinocchio Awards, and at the D12 red lines protest and march. After the Paris attacks the Guardian angels provided the right note of solemnity and concern at street protests, which accorded respect to the victims and the families of the victims of the Paris attacks, while also asserted that the real state of emergency was the climate emergency and the importance of civil society having a public voice under the state of emergency. Despite our different focus we had a constant news chatter on twitter and facebook with my reporting from the UN Blue Zone while the Climate Angels manifested at various locations across Paris. John: I was privy to briefings by Australian diplomats and politicians while at the conference. Our diplomats worked very hard in the background providing bridging proposals and compromises for other parties to try and form a consensus. Along with other NGO observers from Australia I had informal off the record discussions with Bill Shorten, Richard Di Natale and Mark Butler, and attended a reception hosted by Foreign Minister Julie Bishop. We were more let down by our politicians and Australia's current climate policies and targets which are not nearly ambitiuos enough. Malcolm Turnbull's statement at the start was all style, little substance and brought nothing substantially new, unlike some of the other national leaders. Australia announced we will meet our 2020 targets, but this will be done through applying Kyoto first commitment period credits from (2008-2012). Australia had very generous emission targets of + 8% on an inflated 1990 baseline from high landuse emissions that year. It allowed us to increase emissions from 1997 to 2012 by 28 percent, while other countries were actually doing the hard yards and reducing their emissions. Our total Emissions increased by 2.4 per cent from 1990 to 2012, or an increase of 31 per cent excluding LULUCF (Land use change). The COP decision encourages countries not to use carryover credits but write them off and several European nations have done so. Instead on 22 December Greg Hunt applied to use these credits for Australia's pitifully low 5% 2020 target. Georgina: The future - what's next? How do we keep the momentum up from this agreement? John: We need to keep building the climate movement, educating people in the community what climate change means and what is required for adapting and slowing down climate change. We need to keep pressure on Government at all three levels and business to adopt energy efficiency, sustainability planning, and methods to regulate and reduce carbon emissions. (See my report back: The Paris Moment and beyond: John Englart reports back to Climate Action Moreland. Climate Action Moreland is doing work on heatwave impact and health risk in urban areas. This provides a way to talk to people about climate change and immediate risks to health and what they can do. We are also focussing on closing the Hazelwood Power Station owned by French firm Engie. We see this as key to reducing coal fired power in Victoria which will also make room for more renewables in the grid and enhance the steps taken by the Andrews Government in renewable energy and a Victorian Renewable Energy Target. This year we will also focus on the Moreland Council election and Federal election seat of Wills to ensure climate and sustainability issues are canvassed by all candidates and prominent in the campaign We have had a supportive local member in Kelvin Thomson, and we want to ensure the person who succeeds him is also willing to raise and campaign on the issue. Koh Lanta’s ‘Climate Change Song’. We must have talked overtime as the last suggested track, the Climate Express song by Skatchou Bottos which won a Belgium climate music competition, was not played. After listening to Danton Jay & Heather Lynn two songs on Youtube from their theme album ‘Decades After Paris’, I actually bought the digital album, one of my few digital music purchases. Great independant music worth supporting. So here are those 6 songs in a Youtube playlist. About 21 minutes.